Highly anticipated on my end, William Covert‘s solo album doesn’t disappoint in the slightest. The seven tracks on display are based on keyboard motives, atop which drums are played, half-written, half-improvised. Thanks to the odd metres often found in said tracks, the vibe is very much into progressive rock territory. Music for Synthesizer and Drums is excellent, and it’s quite enjoyable just letting it drone on in your ears. Key to Abyss‘s Beautiful Demons is a free jazz concept double album. If that itself doesn’t pique your interest, you’re a lost cause! While the concept itself is blurry and implicit, the music portraying it is quite exciting. I think the obscurement of the story was on purpose—you know, “here’s the music and make your own story” kind of deal? Finally, it’s a bit unfair to only specify “free jazz”, when the album takes cues from a much broader range of genres and styles, such as rock, noise, and metal. It’s a long album, at almost two hours and twenty, but it’s quite fascinating all the way through! Out on the 15th, Hazel is the debut release of Drew Williams’s Wing Walker Orchestra. The New York undecet plays lush and vibrant compositions, including the twenty-minute “Hazel” suite, based on the science-fiction graphic novel “Saga”. With some electronic music touches, quirky rhythms, and some compositional idiosyncrasies, Hazel is a wonderful album, and a surprising debut! 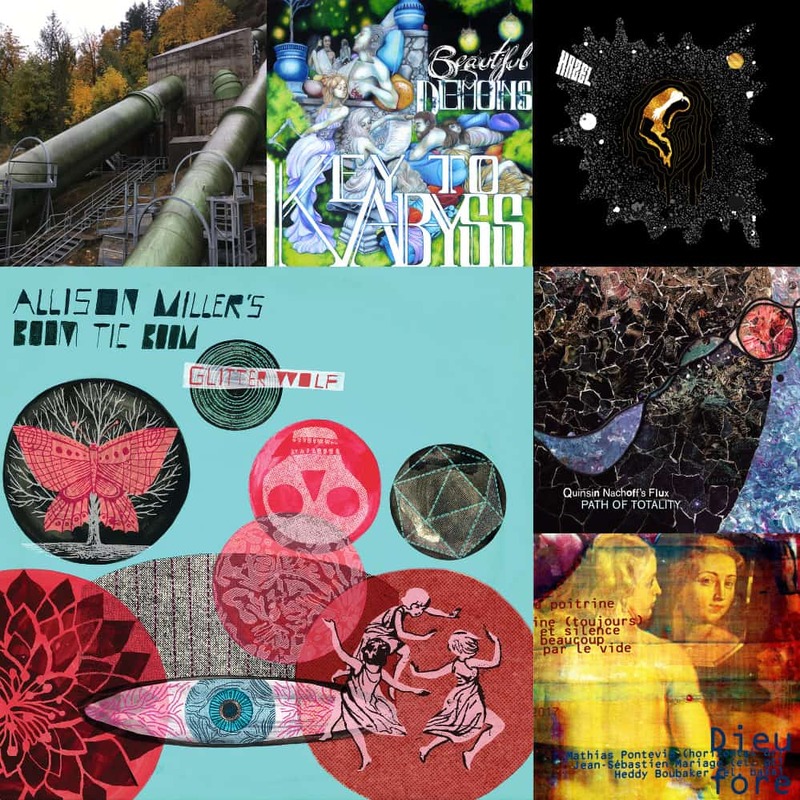 Drummer Allison Miller continues the legacy of her 2010 Boom Tic Boom album with Glitter Wolf. It’s mainly jazz, quite modern from what it seems, with strong influences of folk music. It’s upbeat and features a pretty wide range of instruments, including violin, cornet, and clarinet. It’s a strong album, with strong musicians! Here’s a short video about Allison Miller on drums. Out this Friday, Path of Totality is the most recent effort of Quinsin Nachoff’s Flux project. The compositions here are each very unique, and stem from different visions led to their artistic conclusion. Some highlights, for me, are the double drumming of “Path of Totality” and “Orbital Resonances”, the bouncing ball motives of “Bounce”, and the military parade commentary “March Macabre”. It’s a fantastic double album! Bermuda Cruise is starting to truly stand out as a label, with important past releases like Moteur!, Gneiss Rock, and Jankomas. With the upcoming release of Fore, by the Dieu trio—on the 15th—it will only make things clearer. The album is a live recording of improvisations, “free rock” if you will. It’s forty minutes long, and it’s at times quite contemplative, like the provided excerpt “Qu’un vent, qu’un vide”, and at times quite eccentric and unleashed. It’s a formidable album! On	February 4 2019, this entry was posted.